The team at Guardian consider Geophysical Survey a core activity. We deeply understand the cost of acquiring geophysical data and the value of collecting that data to the highest possible standard in a safe manner. 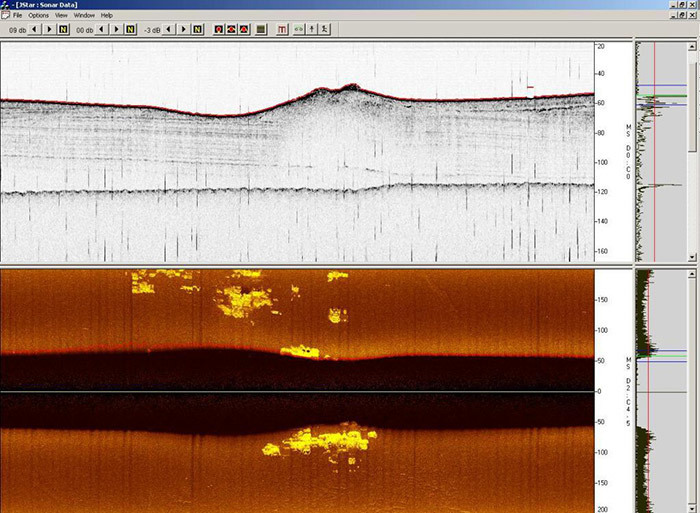 Our experience in the acquisition, processing and interpretation of data from multibeam, side-scan, magnetometer, sub-bottom profiler and towed video camera ensures projects are in safe hands. With dedicated project management, from the kick-off meeting to final deliverable’s, we work assiduously to acquire and report on time, budget and quality. 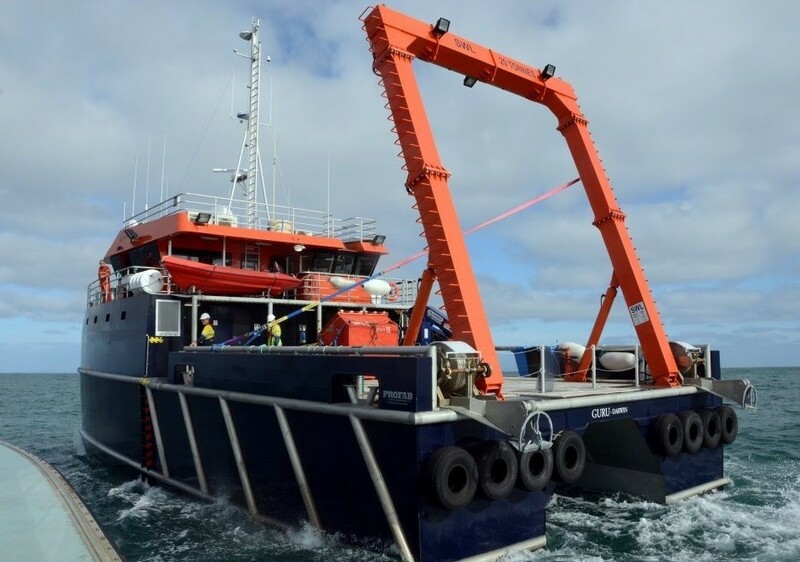 Our vessels are purpose built for undertaking marine survey operations, and are permanently fitted out with essential survey and positioning equipment. Our vessels are engineered to facilitate the rapid mobilisation of underwater sensors to meet the requirements of projects. 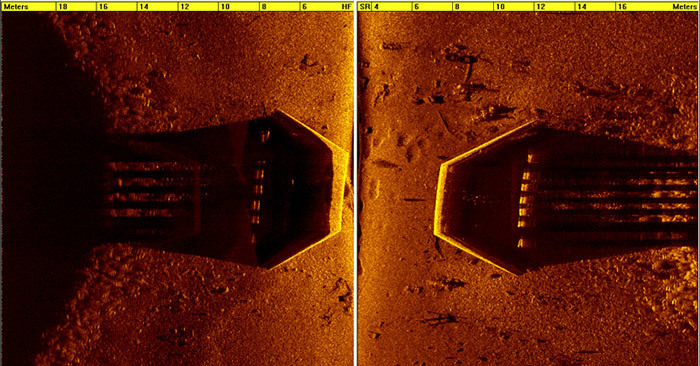 Multibeam, sub-bottom profiler, single beam can be added in a matter of hours through purpose designed moon pools. MV GURU with her 20-tonne A-frame. 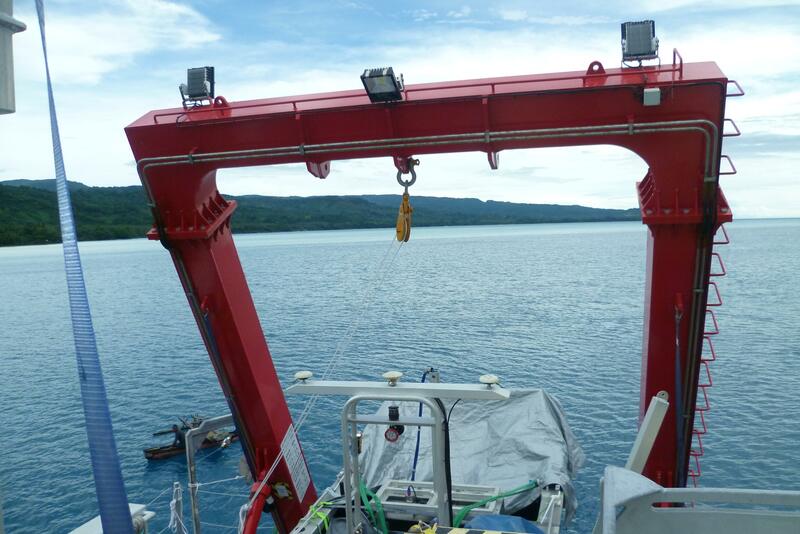 On the back deck, our 20-tonne A-Frames are specifically designed for marine survey tow and deployment operations. Towed geophysical sensors such as side-scan sonars, boomers, sparkers, magnetometers can safely be launched and towed. Our low-engine emission engine noise comes about from efficient vessel design permitting smaller engine size and low vibration mountings. 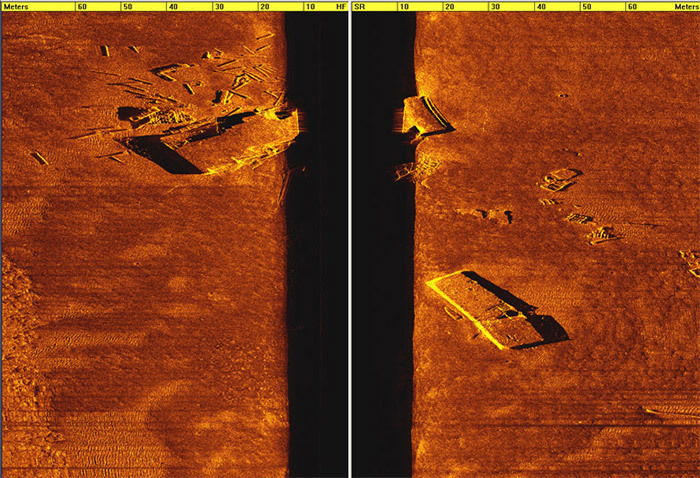 Multibeam Echo Sounders (MBES) are a key tool for acquiring bathymetry data. They are widely regarded as the second paradigm shift in our industry. Our team has been using Multibeam technology on a daily basis since 1993, heavily involved with the first Atlas Fansweep 10 units to Australia. Since then we have used almost every vendor (with varying degrees of enjoyment!) from Reson, Kongsberg, Simrad, R2Sonic, Edgetech, Wassp, Atlas, Tamu², Geoswath and Tritech. 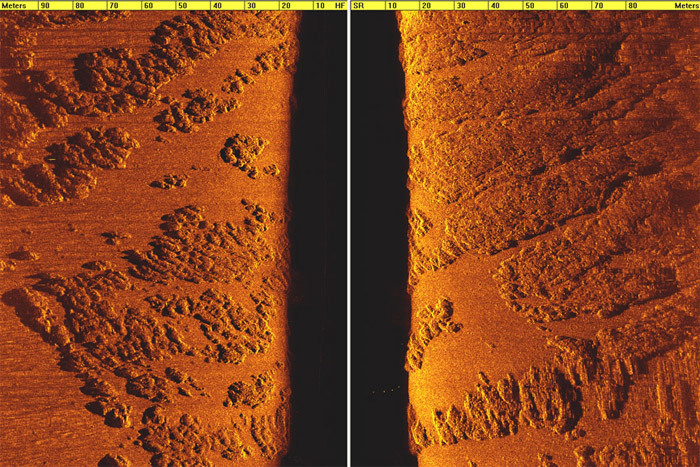 We are strong advocates for the UNB Multibeam course and deeply understand the principles of sonar. Experience demonstrates that the current generation of sensors from all major vendors meets or exceeds bathymetry acquisition for the purposes of nautical charting. Reference frames for the MBES, Vessel and inertial position, heading and attitude sensor. These are often termed offsets and rotations. Sounds easy, just ask any non dimcon surveyor! MBES and INS mount engineering. At Guardian we design and manufacture our own MBES poles and moon pool mounts as we know how critical this is. Accurate timestamping to UTC standards with PPS. SVP at the head in real time. Undulating SVP in waters with complex chemistry and thermoclines. Vertical datums to ensure all survey lines match, and the final depths reported are to a known reference surface, be it ellipsoidal, LAT or Chart Datum. 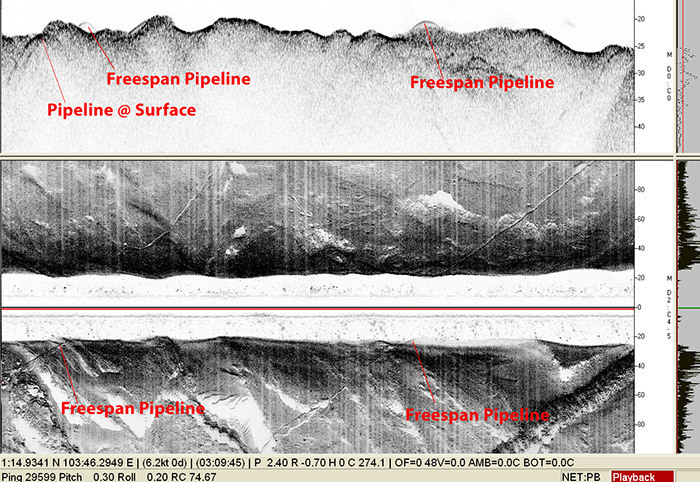 Regardless of water depth or interferometric Vs multibeam, our team can deliver. 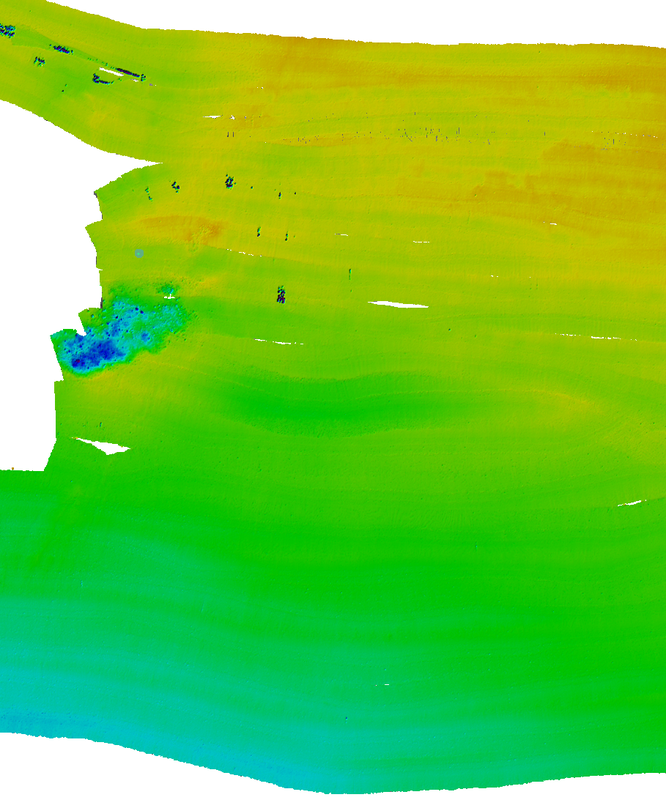 Bathymetry from an MBES is the fundamental dataset. Not only does it provide a map of the seafloor depth in your area, it also provides a map of the topography in great detail. From this, it is relatively routine to generate data products such as contours, gradients maps, shaded relief maps and longitudinal profiles. For industry, these products are heavily used in the engineering design of any offshore installation be it Oil and Gas, or Renewable’s. The Guardian philosophy for bathymetry processing is robust and reliable. We process from raw data using CARIS as the basis. CARIS is the leading MBES processing tool, is well documented, and has a wide user-base well skilled in using the software. 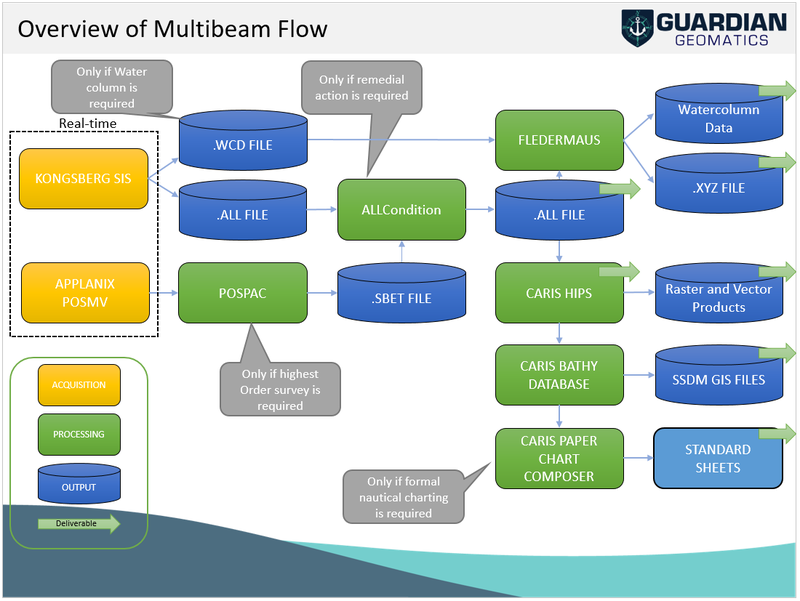 Multibeam data typically contains 2 or 3 forms of data. All systems provide depth to the seafloor, which is often the key deliverable. 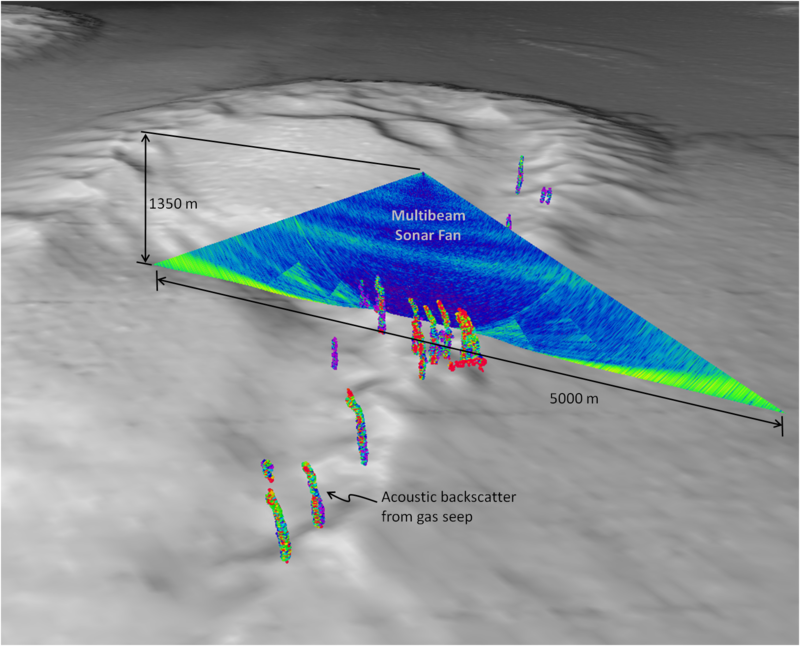 A secondary by-product of a survey is the multibeam backscatter. 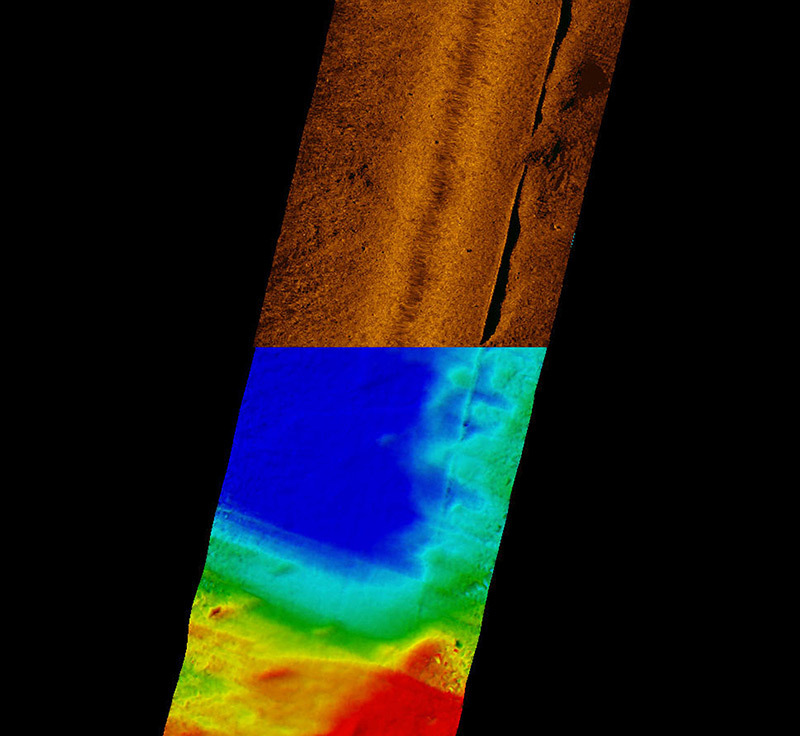 Backscatter can be used to characterize the properties of the seafloor; it is representative of the texture of the seafloor. While Backscatter is ‘free’ it is not quite as easy as that. If high quality backscatter is a required deliverable, the collection needs to be taken into account when configuring the MBES. At some point there is a trade-off between optimised settings for Bathymetry vs Backscatter. The trade-off price is not so high that backscatter should be ignored – to the contrary, it is a valuable dataset and should be factored into all MBES surveys. 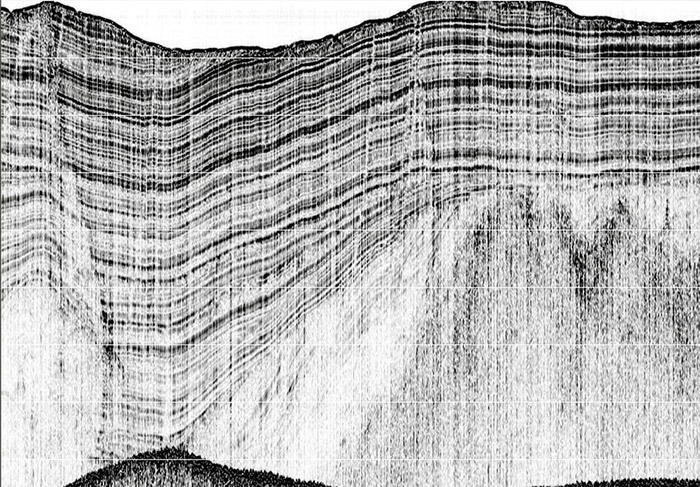 The backscatter illustration below highlights different seabed characteristics, typically the texture of the sediments which are not picked up in the topography. The value of backscatter compared to the cost is a compelling reason to always acquire and process backscatter. In the example below, the seafloor is very shallow, very flat. An interpretation of the bathymetry topography and relief would suggest a benign seafloor. 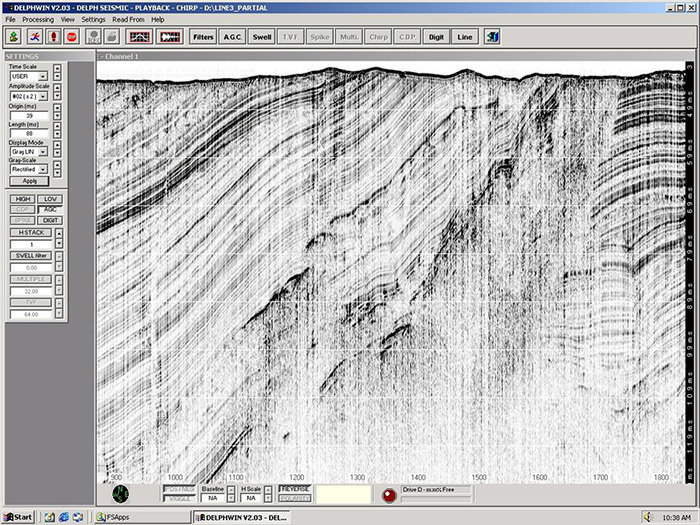 The backscatter reveals a far more complex environment with different sediment types. These will naturally lead to differing habitats and biology. Without backscatter, this would remain unidentified. INSTRUCTIONS: Use the slider to compare the Shaded Relief Bathymetry with the Backscatter. The Backscatter Working Group Report has an excellent overview of the use, development and value of backscatter. 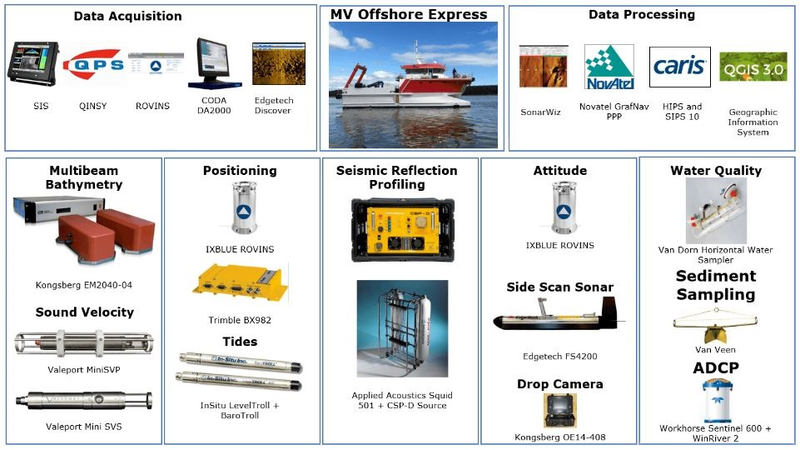 A few modern multibeam sensors, in particular Kongsberg and Reson, offer capture of mid-water data. 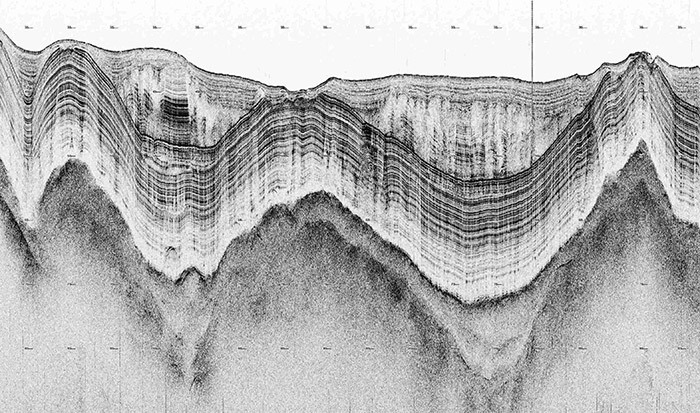 Mid-water data is a time-series intensity plot for every beam. In many ways it is like a side scan sonar time series, which would be a 2-channel port+starboard sensor. In the case of multibeam, it is more likely to be 256 or 400 channels, i.e. at least 100 times more data than a conventional sonar. This increase in data volume is perceived to be the single largest challenge to WCD adoption. Fortunately, external hard disc systems have rapidly increased in capacity, thereby permitting this data to be acquired with minimal additional cost. As a worst case scenario, an MBES pinging at maximum rate in shallow water may collect as much as 50 Gigabytes data per hour. Over 24 hours, that means 1.2 Terabytes per day. Given the cost of a 4TB drive is now about A$50/TB, the cost is no storage longer prohibitive. Processing remains challenging and is improving in efficiency every month. Automated identification of mid-water targets is now possible, thereby filtering out 99% of the data. Mid-water data products are currently focused on 2 areas, habitat and seep mapping. Habitat mappers can gain an understanding of bio mass in the water column at an unprecedented level of detail. Seep mappers can identify individual natural seeps percolating from the seafloor. This is a fantastic indicator of natural reserves at greater depth. The team at Guardian has a wealth of experience in acquiring, QC and processing WCD data in water to 6000m water depth and strongly advocate for the collection of the full water column while the vessel is both undertaking survey operations and during all transits. BELOW: An image produced by the University of New Hampshire Center for Coastal and Ocean Mapping/Joint Hydrographic Center using IVS Fledermaus software. 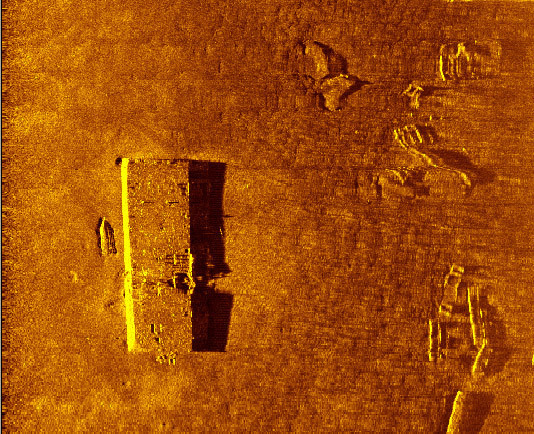 Side-Scan Sonar (SSS) is the bastion of seabed mapping. It predates MBES and has proven itself for decades. With advances in MBES backscatter, the demand for SSS surveys has changed. 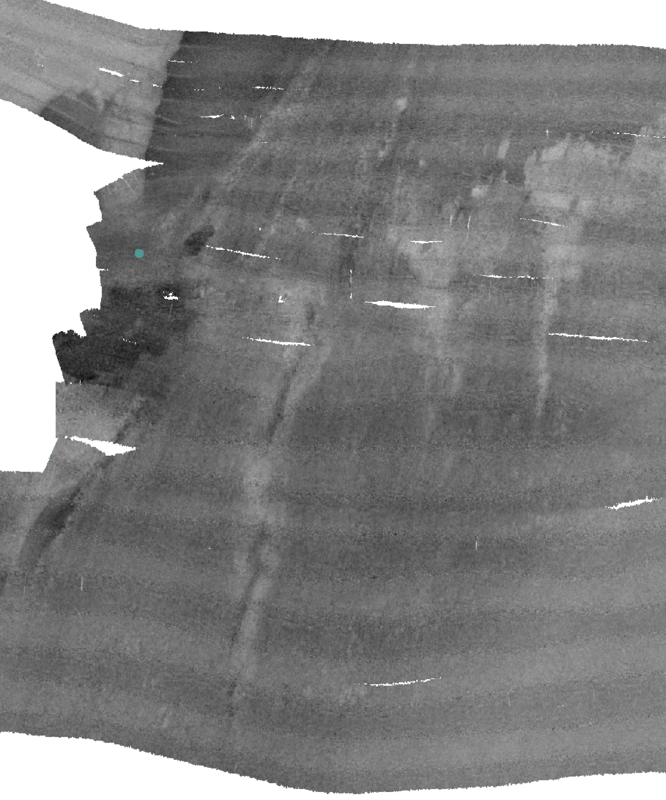 SSS is now used where high resolution in deeper waters is required, or where the low grazing angles provides an oblique perspective on seafloor features. To this day, it remains the most efficient form of pipeline span on the continental shelf, typically in depths less than 100m. We use the latest sonar hardware from Edgetech, Klein, Tritech and Kongsberg, using the highest available frequency your project permits to ensure we achieve the highest possible resolution both across and along track. Data is always recored in the vendor specific raw file format to ensure meta-data is fully recorded. For Edgetech this means JSF file format. Generic transfer formats such as XTF are generated as a processing task, also injecting clean navigation, attitude and altitude data. 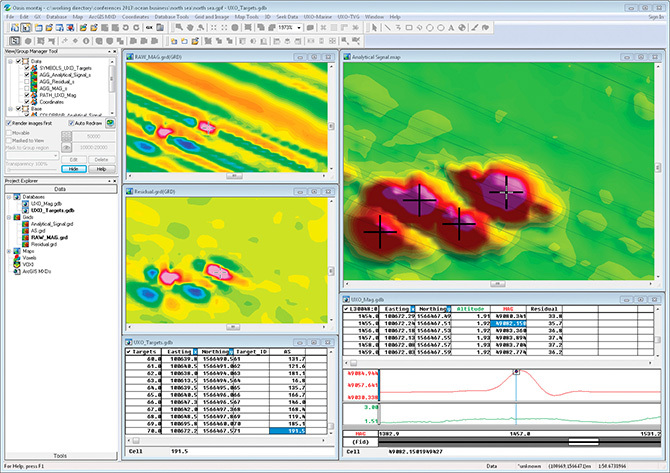 Final processing, and analysis is undertaken using either SonarWiz on CARIS SIPS to extract features and create high resolution raster mosaics. 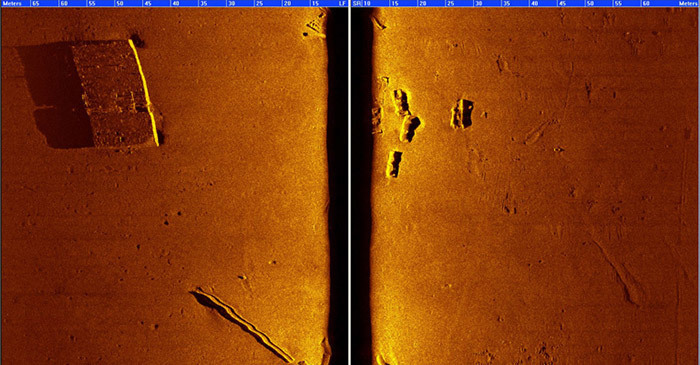 Below are representative Side Scan Sonar screenshots from Edgetech sonars. These are not outstanding examples. They are typical of what can be expected. Sub Bottom Profilers (SBP) are the most efficient tool for remotely sensing layers of sediment and rock beneath the seafloor. The sub bottom profiler is similar to that of a simple echo sounder, but with more power and a far lower frequency. A transducer releases a sound pulse vertically downwards towards the seafloor, and a receiver records the return of the pulse once it has been reflected off the seafloor. Unlike a simple echo sounder, the lower frequency will also penetrate the seafloor, with some sounds being reflected off each sub-bottom layers or strata layers until all the sound is absorbed under the seafloor. This remote sensing is a first pass to understanding the shallow geology of an area, and is often used to gain an initial understanding of the foundation properties prior to physical sampling with Geotechnical Equipment. 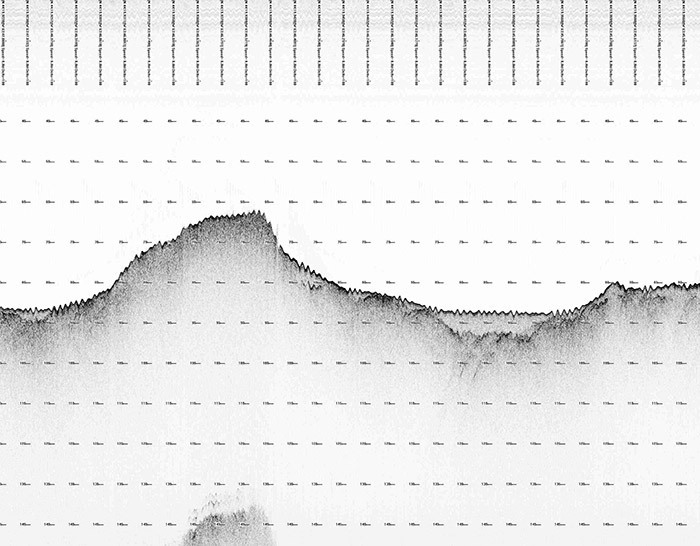 The SBP technique needs to approximately match the expected shallow geology in your area and the penetration your project requires. Shallow penetration surveys will operate with a boomer at 700-2000Hz and will produce some of the highest resolution possible. Ideal for pipeline and surface lay engineering in coastal and sheltered waters. 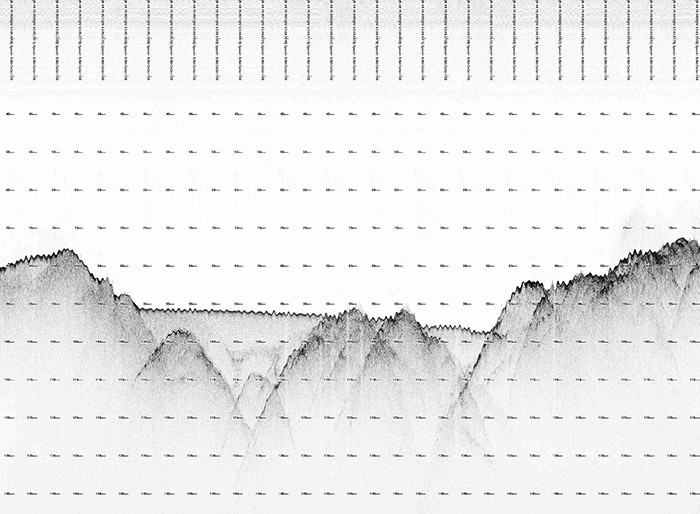 Medium penetration surveys often operate with a chirp source in the 2-24kHz range. The spread spectrum chirp offers more penetration and a more flexible weather window and good resolution. Deep penetration requirements, a Sparker running in the 300-1200kHz range is probably the best choice. Each tool has benefits and limitations. Guardian will ensure the right tool is applied to your project. ABOVE: Representative Sub-Bottom Profiler screenshots from Edgetech Chirp systems. A magnetometer is a scientific instrument used to measure magnetic field strength. 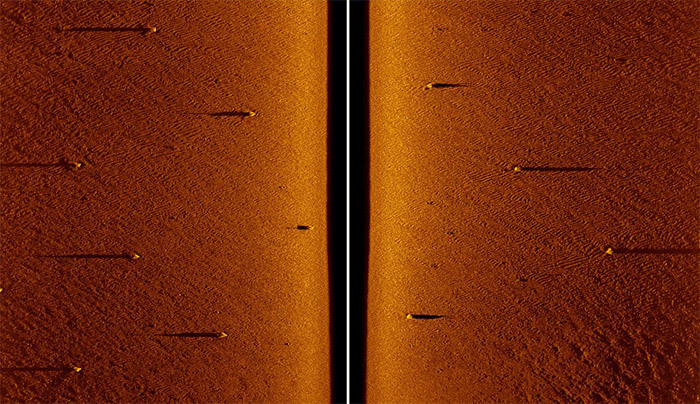 Guardian use marine magnetometers, typically in conjunction with a side-scan sonar, to detect variations in the total magnetic field of the underlying seafloor. Usually, the increased magnetization relative to background value indicates the presence of ferrous material on the seafloor, whether from a shipwrecked boat made of steel or a volcanic rock containing grains of magnetite, undersea cables and bridge foundations; and most importantly to identify Un-eXploded Ordnance (UXO). Our magnetometers are towed a few metres behind the side-scan sonars very near the seafloor. This ensures even the smallest of ferrous material is detected. Data is acquired using QINSY and processed and visualised using eithe MarMap or Geosoft's Oasis Montaj to produce raster data ready for contouring and interpretation. ESRI ArcGIS for coverage, production rates and line planning. 4.5 knots in single swath mode, 7.5 knots in dual swath mode.